Perhaps the #1 harness used in tracking! The Sure-Fit® Harness features 5 points of adjustability to fit most any dog. When your dog pulls or tries to run ahead during your walk, the harness places pressure on the breastbone instead of the throat. This makes it easier and safer to control your dog and also prevents choking and gagging. It’s also a great option for very small dogs with delicate throats. The Sure-Fit features an easy-on, easy-off design with two quick-snap buckles. 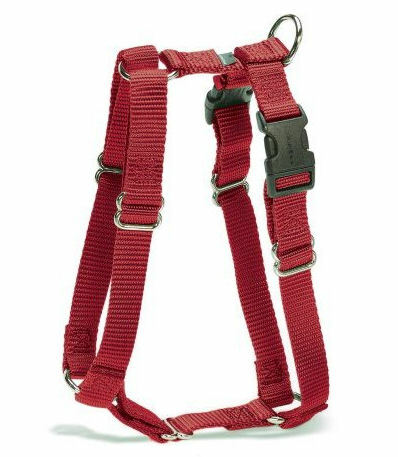 For dogs who slip out of traditional collars or who pull on the leash, the Sure-Fit Harness will keep them under control. We have a limited supply of discontinued colors - they are listed on the drop down color selection box under Discontinued colors. Next to the color is the size the harness color is available in XS (XtraSmall) S (Small) M (Medium) or L (Large).